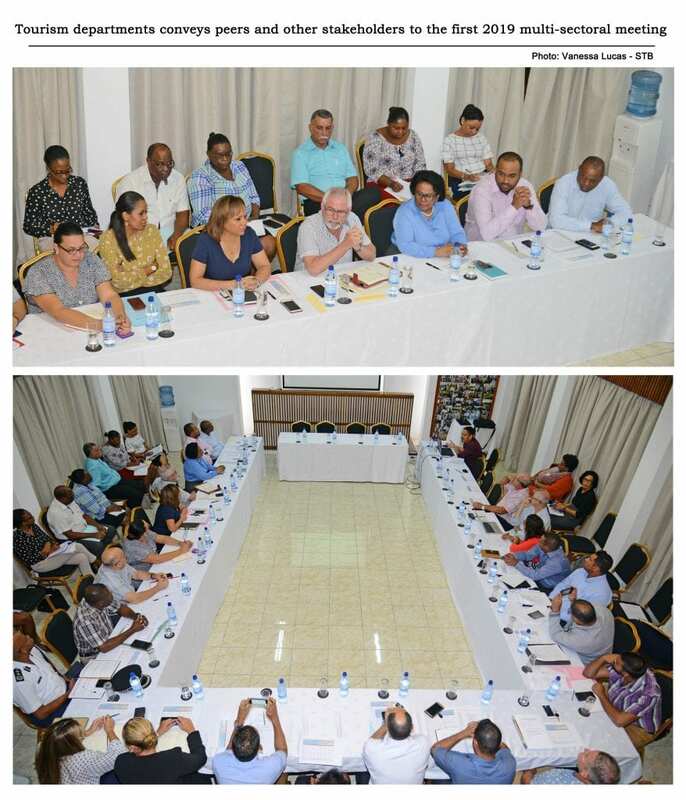 High officials representing various agencies, members of the tourism-trade and other stakeholders met again on February 1, 2019, three-months following their last assembly in October 2018. The first multi-sectoral meeting of the year, which took place at the National House, was presided by Minister Didier Dogley, Ministers for Tourism, Civil Aviation, Ports and Marine. The meeting saw the presence of his counterparts Minister for Employment, Immigration & Civil Status, Myriam Telemaque; Minister for Environment, Energy & Climate Change, Wallace Cosgrow and Minister for Finance, Trade, Investment and Economic Planning Maurice Loustau-Lalanne. The agenda included presentations from the National Bureau of Statistics (NBS), the Central Bank of Seychelles (CBS), and the Seychelles Land Transport Authority (SLTA). The presentations by the NBS kept the participants of the meeting abreast with the latest figures including tourism earnings and expenditures. The NBS team mentioned that the aim of the surveys conducted by its teams at the airport and the port aims at having accurate information on every market. They reported that for last year, $563,9 million was earned form the tourism industry, the country’s leading economic pillar. This represents a 16.7 percent increase from 2017’s earnings. Seychelles ended December 2018 with 361,231 visitors that disembarked in the island nation, a figure which is four percent above that of 2017. The tourism industry is already seeing an increase in visitor arrivals for 2019 as figure have increased by 16 percent when compared to the same period last year. Since the start of 2019, over 33,700 tourists have set foot in the country. On its part, the CBS reported on the balance of payment. They stated that Seychelles is primarily a service-based economy, where tourism accounts for more than 25 percent of the country’s GDP. While the Department for Finance presented a brief on the operating cost in Seychelles, during his short intervention the Minister for Finance, Trade, Investment and Economic Planning Maurice Loustau-Lalanne mentioned that the department is actively working towards reducing business costs related tax considerably. The two authorities explained the methodology of how data was collected and requested all stakeholders to collaborate in order to be as correct as possible. The SLTA provided an update on the Road maintenance plan including all the development work on roads and their timeframe. The Risk Management Section from the Tourism Department circulated their latest figures regarding the crime issues affecting the tourism industry in 2018, showing a 61% decrease in crimes as compared to the same period in 2017. In his address to the press Minister Dogley expressed his convictions that the Multisectoral meeting adds to the benefit of all stakeholders, he confirms that various issues have been addressed through the meeting and other issues are being taken care of through the continuous meetings. “What the country wants to see is meaningful and real growth in the industry in general. It is important that the meeting continues on this positive note and that all stakeholders engage in discussions in an effort to jointly identify and implement tangible solutions.” said Minister Dogley. The aim of the multisectoral meeting is for the public and private sector, involved in the tourism industry, to continue to work together as partners. As a result, the tourism sector can be strengthened for the country to be able to draw more out of the industry and prosper.